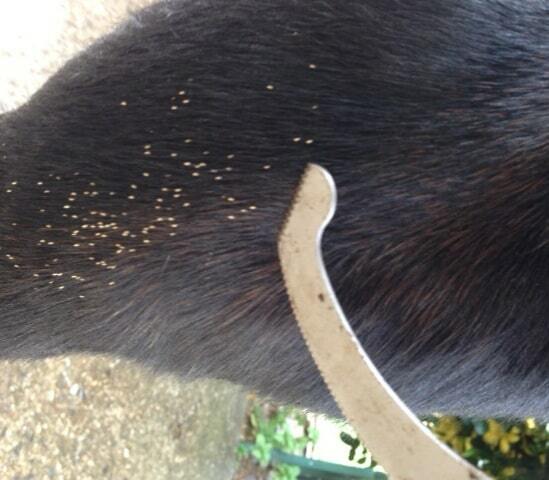 It’s Autumn and our horses are changing coats ready for winter and the bot flies are also out and about. 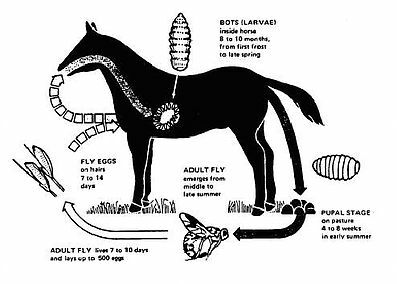 When horses are starting to grow their winter coats, they often seem much more sensitive to flies even though there aren’t so many about, except for bot flies of course. Maybe that is why they are more sensitive. 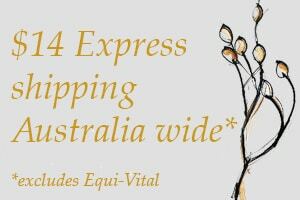 To reduce the number of bot eggs being laid on horses’ legs, my all natural insect repellent, Fabio’s Comfort Spray is a very good deterrent. You should also invest in a bot knife and remove as many bot eggs as possible, especially from the legs, taking care to place them in a disposable bag so they don’t get the chance to hatch into yet more flies. Bots can cause a lot of damage so it is makes sense to prevent them from accumulating in the stomach in the first instance. Horses may not show any outward signs of infestation but if it is severe then the opening from the stomach to the small intestine can become blocked, which causes ulcers and colic. Bot larvae also burrow into the intestinal mucosa causing small tears which interferes with the integrity of the gut and its normal functioning, with bleeding and infection a result. Ulcers are also caused in the stomach itself. There are two types of blot fly – one which causes inflammation in the mouth area and the other in the stomach and small intestine. So inflammation around the mouth and stomach irritation can both be signs of bot fly infestation. A distended belly is a sign of severe infestation. At this point a chemical wormer which is effective against bots must be used to get rid of the infestation. This should be followed up with a herbal prescription to repair damage to the intestinal mucosa quickly. I can help here as a combination of healing herbs is needed to produce a good result. Chronic gut damage is a common cause of colic at a much later date. Quite a few of the natural feeds I use in my VF Natural Diets give the gut a friendly sweeping helping to remove worms, dead or alive, plus sand and grit. The best is Millet & Linseed Porridge, the millet works because of its high silica content and the linseed provides mucilage to soothe the gut at the same time. However this does need to be used routinely to be effective.